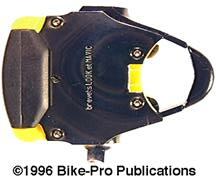 The 646 pedals are the Mavic implementation of the original LOOK clipless pedal system. They use the same LOOK mechanism found in the LOOK pedals except fot the S2 series, please read about the mechanism and how it works in the first paragraph of the LOOK overview. 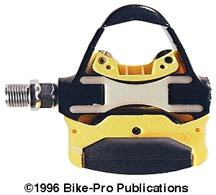 The virtue of the Mavic pedal is that it permits lateral rotation of the foot by up to 5 degrees both left and right. 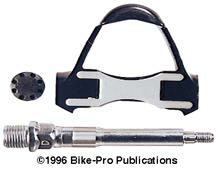 This movement is adjusted and then fixed in either direction by use of indexed adjustments on the bottom of the pedal. This system permits you to choose, based on your own riding experience, how much you want the pedal to rotate left or right, and set the pedal permitting just that degree of movement on an ongoing basis. You can, at any time in the future, readjust the pedals should your ankle or knee obligate further adjustments. Mavic achieves this by using an internal rotating cam that is fixed to the adjusting dial at the pedal bottom. The 646 pedal body is made in two parts that lock together and are additionally joined by a high polished stainless steel plate that has four recessed Torx T-10 head machine screws, making the pedal a single solid unit. The two parts are best described as the "heel" and the "toe" piece. The "toe" piece is made of cast and machined aluminum. The toe piece houses the spindle and bearing system and incorporates the front toe retaining section which holds the front of the cleat in place.